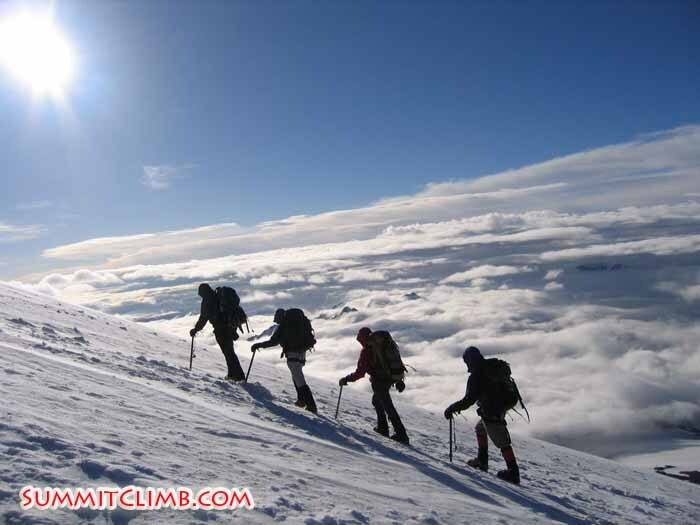 Mount Elbrus is also fun for skiiers and snowboarders!. 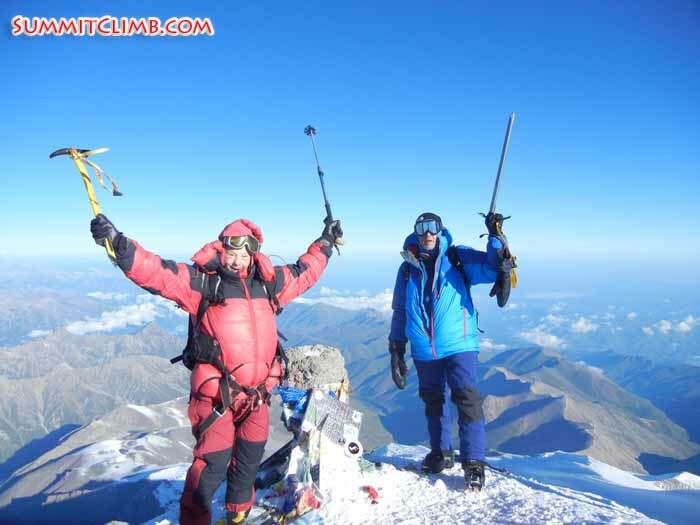 NEWSFLASH: Our August Elbrus team successfully reached the summit at 7am today! Congratulations to you all. Pictures to follow. Greetings to everyone from Pyatigorsk Russia. I’m sitting in an outdoor café, on the edge of a city park, in the heart of Pyatigorsk. Enjoying a nice breeze, pleasant temperatures (23°C / 73°F) and mostly cloudy skies … a nice relief from the extreme temperatures of Elbrus. It’s now that I reflect back on our successful expedition. 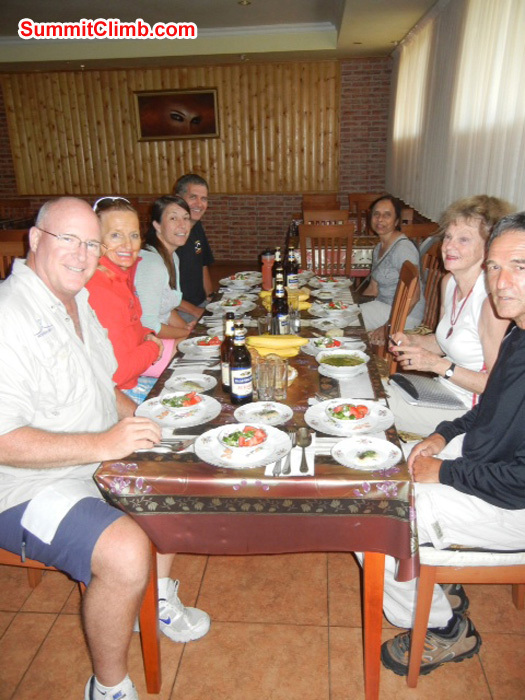 It was just 12 short days ago the team gathered in Pyatigorsk for the start of our expedition. In these 12 days we have not only gotten to know our teammates but we have gained vast respect for one another. For, as it often happens, in adverse conditions you see the true beauty of an individual’s spirit. 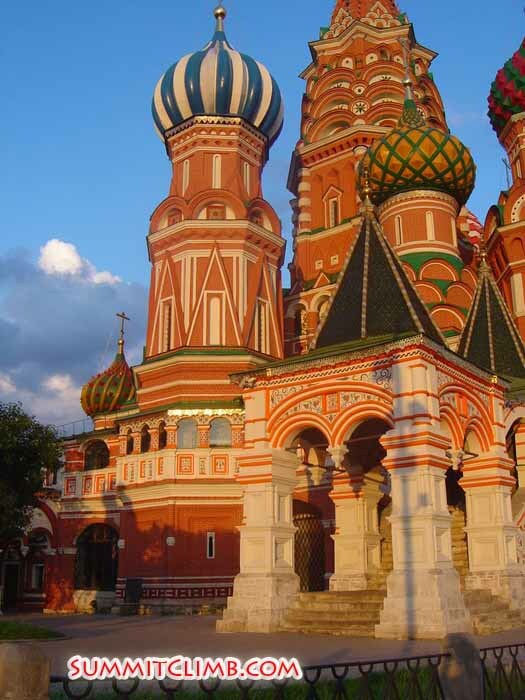 We were lucky to experience so much on this expedition … a wonderful Russian culture, magnificent mountain views, wonderfully clear and sunny days and incredible adverse conditions. After moving to our high basecamp we spent a couple days climbing higher and higher on the mountain to gain much needed acclimatization. 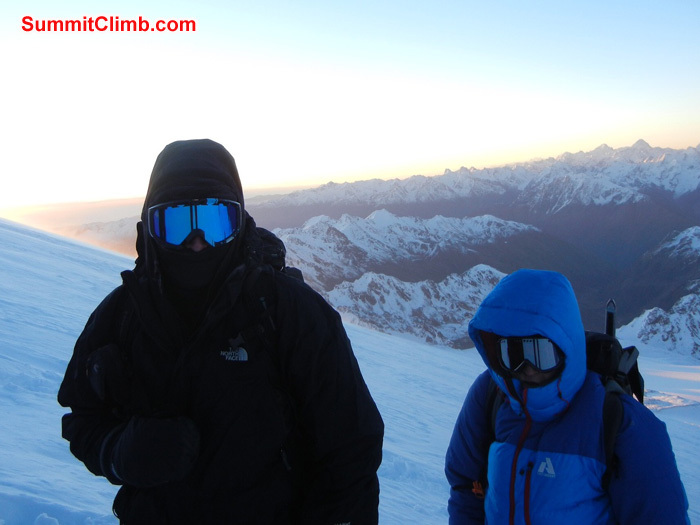 It was enjoyable climbing in pleasant conditions … the normal Elbrus weather of bright sunny skies in the morning with afternoon clouds and light snow showers. It was in these mixed conditions that we finished our acclimatization and were ready for our summit attempt when the conditions and weather allowed. Jan and Dan on the summit. 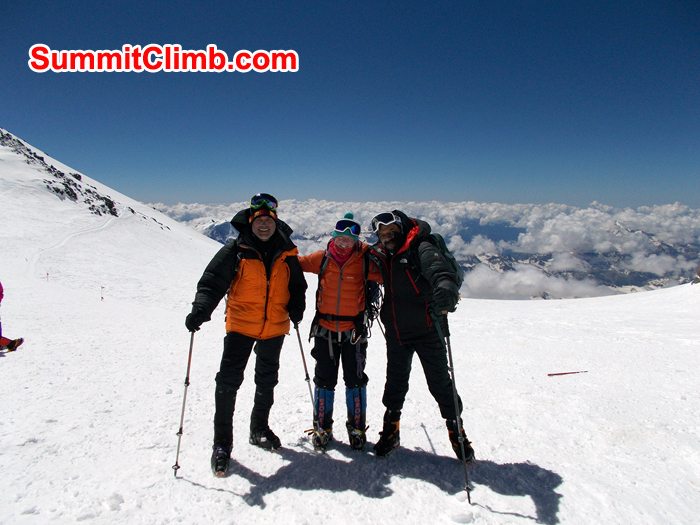 Ryan, Terry, Andrea and Patch on the summit of Elbrus shortly after sunrise. 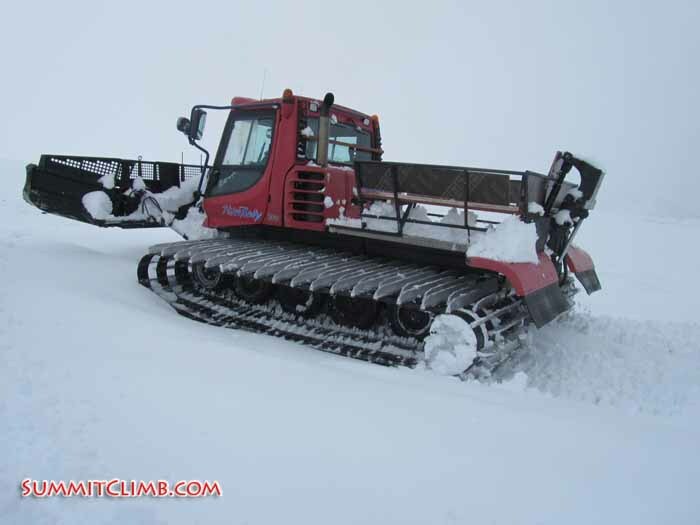 The reliable snowcat we took on summit day (Scott Patch). 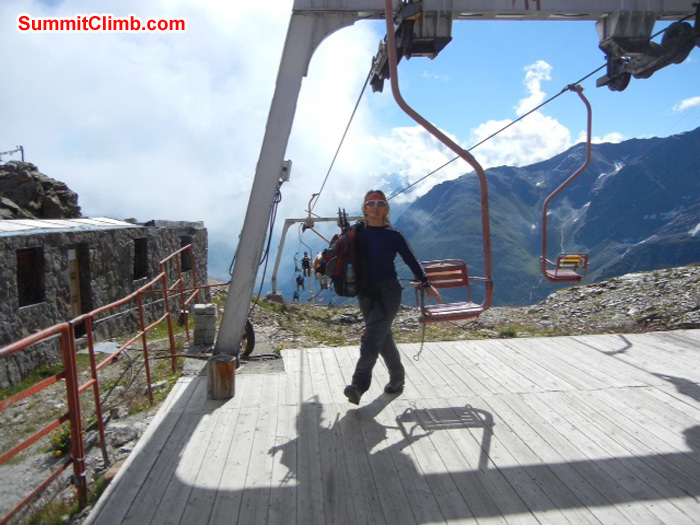 Jules getting off chairlift in Cheget. But we don’t have much time to feel sorry for our losses as we must pull together and establish a game plan for another summit attempt. 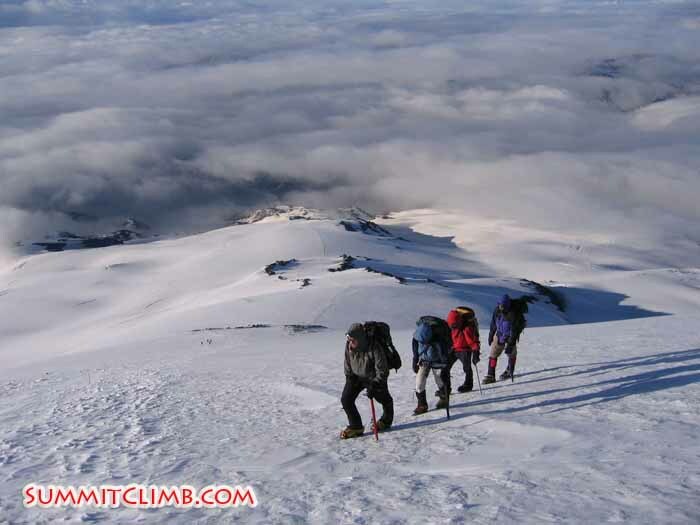 We decide to take a rest day (Aug 1st) and attempt Elbrus again early on the 2nd of August. Rest, which will come easy tonight!! The morning of the 2nd August came fast …. 1:00 am is always early, always. But we awake and start to get ready for the day ahead … So many unanswered questions, will the wind be strong, will it be bitterly cold again, will I have the strength to summit. Only time will tell … best to get in a grove now and focus on the “here-and-now”. So we start up. The wind is light, but any gust reminds you of the weather 2 days ago … please don’t blow to hard, please! The temperatures are cold but tolerable, up we go … one step after another!! 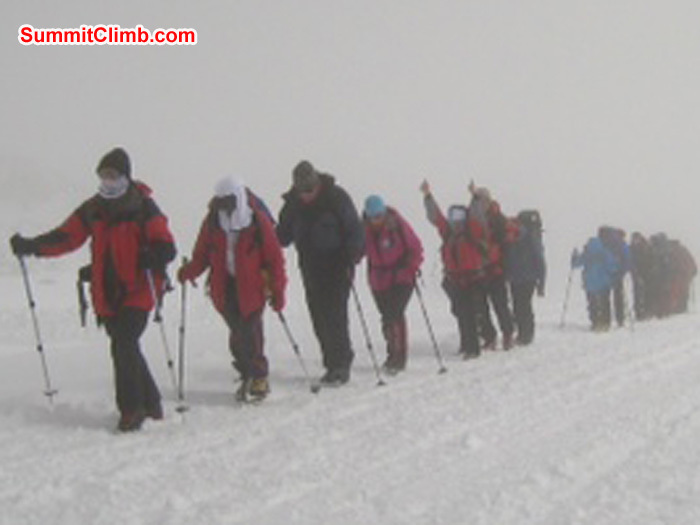 Scott Patch: team heading for the summit . 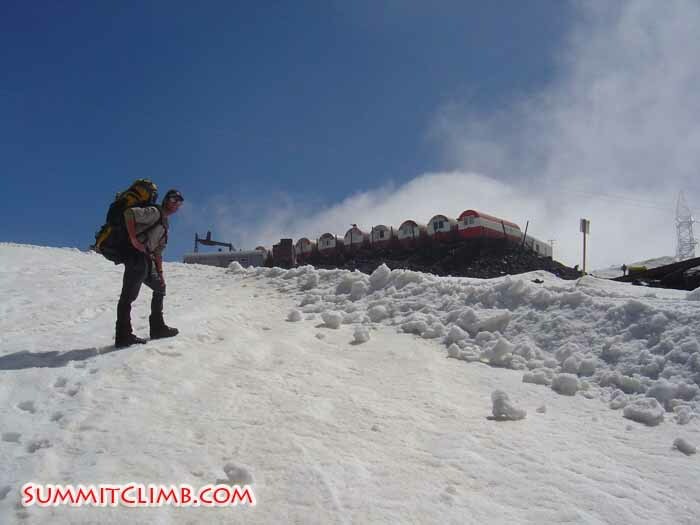 Hey everyone this is Scott Patch with an Elbrus dispatch for August 2nd 2013. Today we woke up to fogy conditions at 1:00 am. In the hour of summit preparation the fog lifted to beautifully clear skis. At just shortly after 2:00am we left for the summit. Thanks to clear skis, light winds and good snow co nditions the summit was reachable. 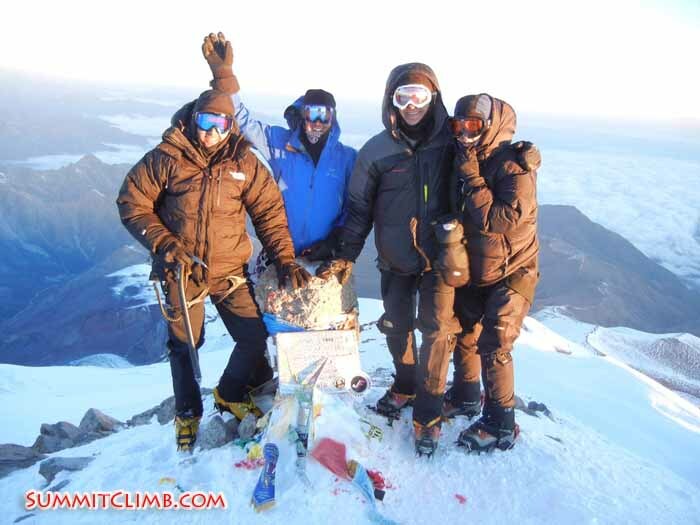 Congratulations to Ryan, Terry, Andrea, Dan and Jan for a great summit push and success on Elbrus!! 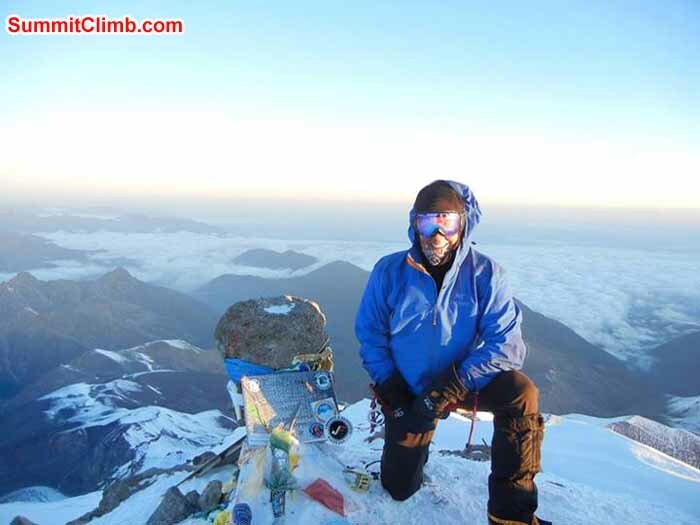 Hi everyone this is Scott Patch with a Elbrus expedition dispatch for August 1st 2013. Today was a much deserved rest day!! We spent our time in the sun visiting with other team members, exploring the mountain around us, meeting new friends on other teams, learning yoga poses from Pramila and gaining vast amounts of knowledge from Ryan Vlasak and his ten point scale to success. 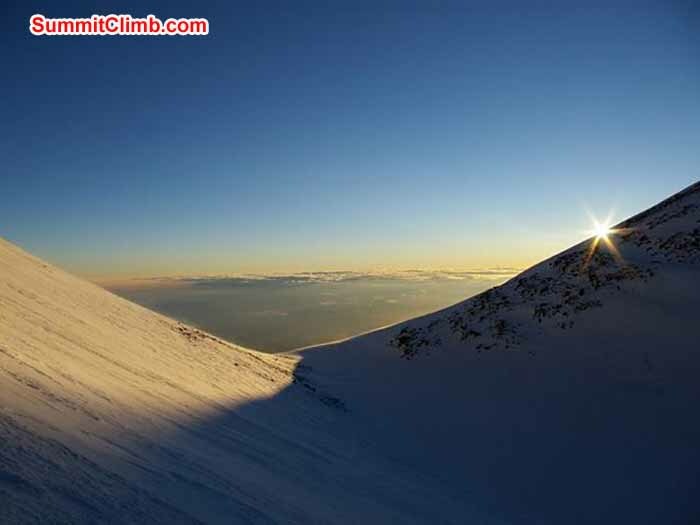 Tomorrow we will leave our basecamp at 2:00 am for our 2nd summit attempt. The weather forecast looks favorable and reports from teams summiting today were very good regarding avalanche danger higher up. It's going to be a big day ... when we make it back down to basecamp we have to back up and quickly head down the mountain to the town of Azau. 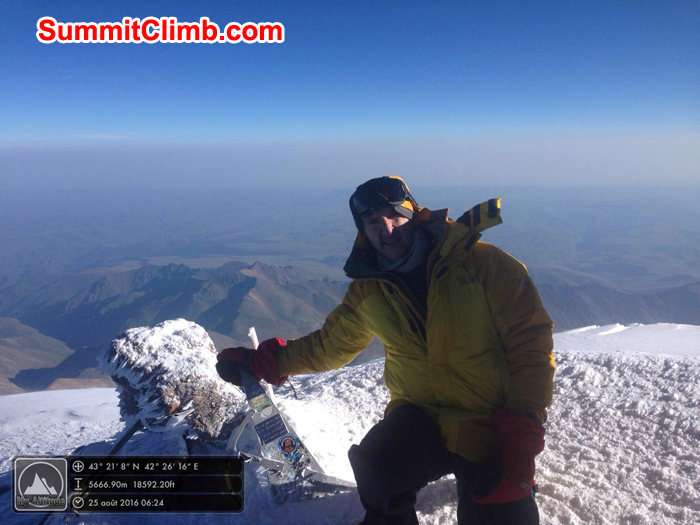 Hi everyone this is Scott Patch with a Elbrus dispatch for July 31 2013. We started our summit attempt this morning to clear skies and light winds. As the night turn to dawn the winds decided to pick up on us. The strong winds continued with us for the rest of the day. 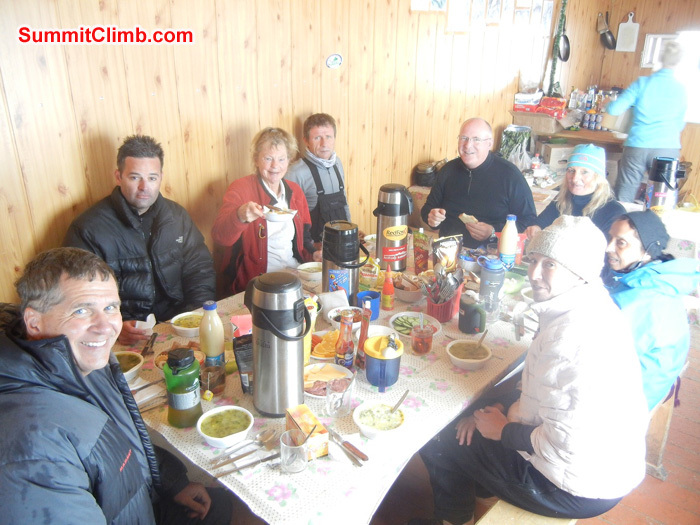 Our high point was the saddle at 5340 meters (17,519 feet). The slopes above the saddle were to unsafe for our liking. So we left the saddle and returned to the huts. Tomorrow we will rest and see what happens after that. 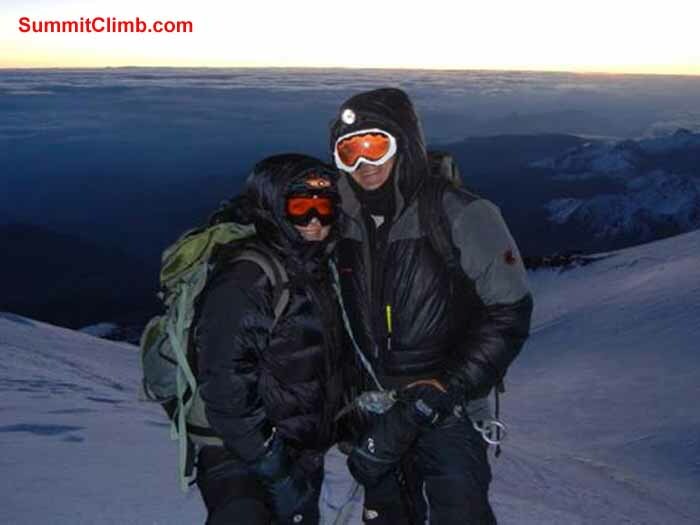 Terry and Andrea approaching summit on 2nd attempt. Jan on way down after aborted 1st summit attempt. 5200 meters. 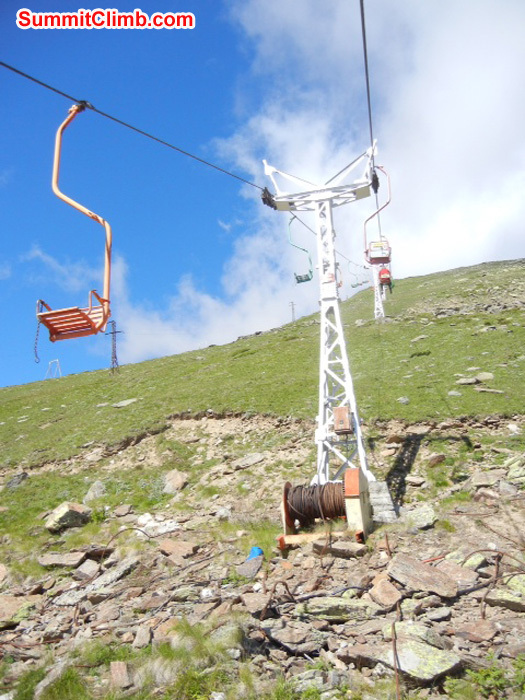 Top tram terminal (right) and bottom of ski lift to just below barrels. Food and gear awaiting snowcat trip to huts. 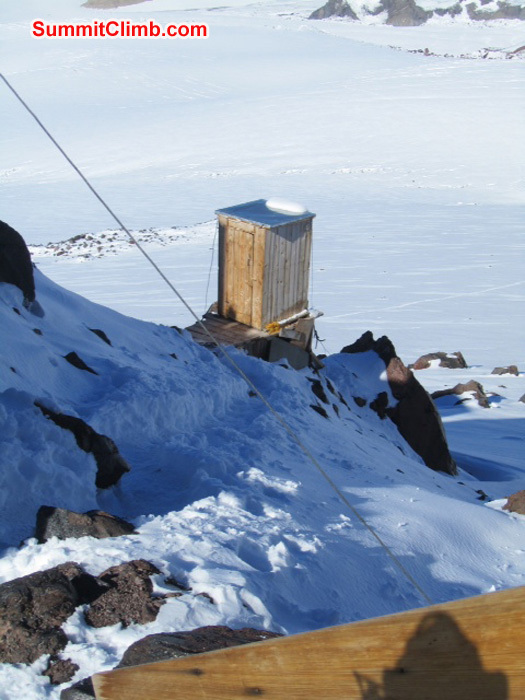 Transporting gear, form top of last tram terminal, to just below barrel Huts. View from tram looking back up baskan valley. Towns of Azau, Terskol and Cheget. 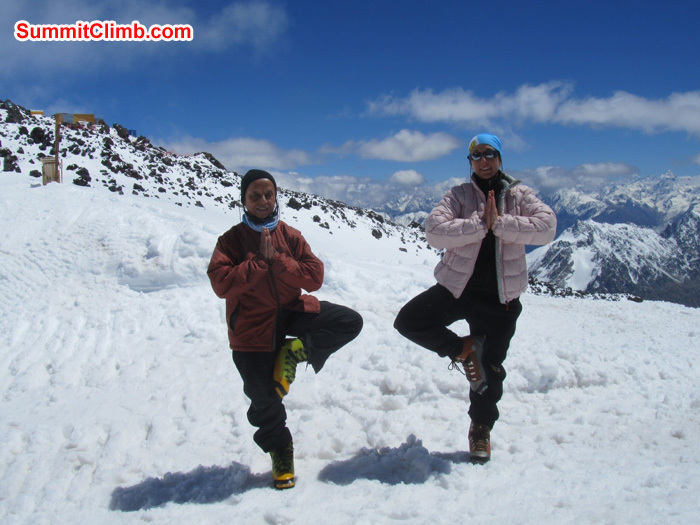 Pramila and Andrea doing yoga on our rest day at Elbrus basecamp 4100 meters (13,450 feet) Photo Scott Patch. Group dinner in the huts. 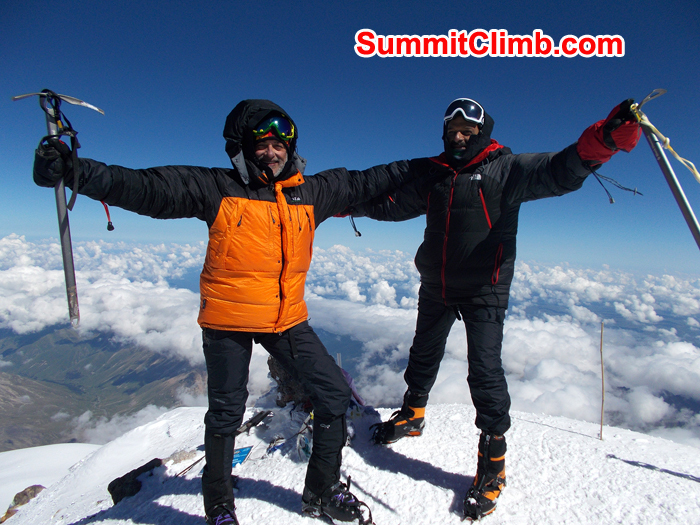 Hey everyone this is Scott Patch with an Elbrus dispatch for July 30th 2013. Today we woke to beautiful clear skis after it snowed most of last night. 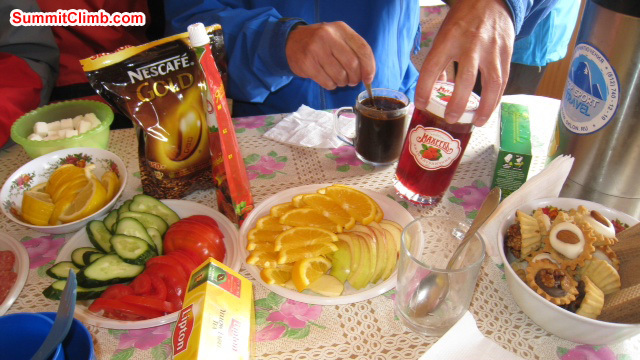 We had an excellent breakfast and got ready to head up the mountain for our 3rd and finale acclimatization hike. We had about 2 hours of climbing with clear skis before the weather started coming in. Occasionally the clouds would part for some breathtaking views of Elbrus and the surrounding mountains. We reached our objective for acclimatizing and headed back down the mountain for a great dinner. After dinner it was preparation time because tomorrow, early morning, we'll leave for summit. 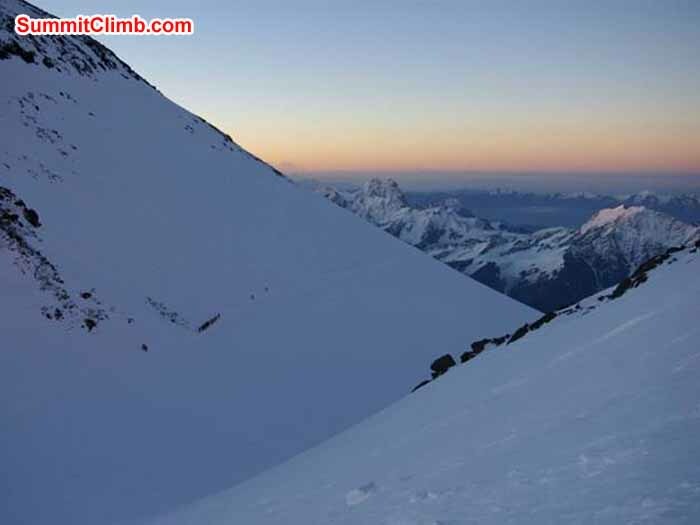 We'll take another look at everything early morning but all signs are pointing for a good summit day. Dan and Ryan on summit push at dawn. barrel huts. 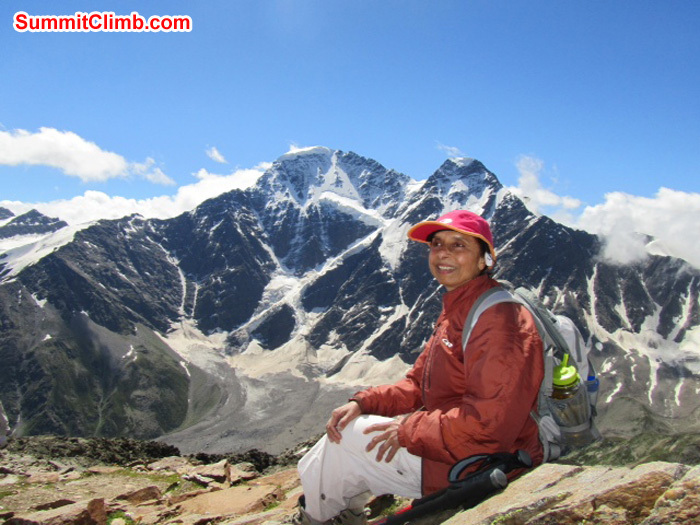 Ms. Pramila Kumari resting behind beautiful mountain. 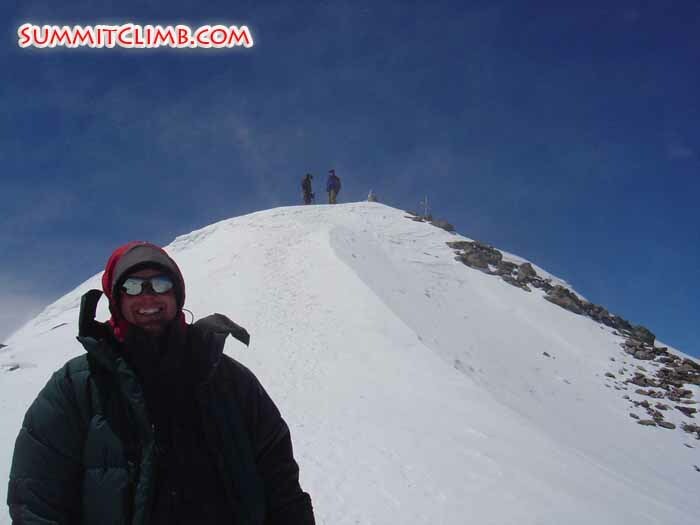 Hi everyone this is Scott Patch from Pyatigorsk, Russia with a dispatch for the Elbrus 2013 expedition. All members have made it and are in high spirits and great health, despite the rigours of travel, time changes, misplaced baggage and cancelled flights. We are ready to leave Pyatigorsk and head for Cheget Russia which sits at 2300 meters ( 7,500 feet) at the base of Elbrus. It's about a 4 hour drive today where we will sit back and enjoy the company of our new friends. Team photo (Less Dan Hasraburda) in town of Pyatigorsk, Russia. Photo Pramila Kumari. Enjoying the shops, atmosphere and streets of Pyatigorsk Russia. Scott, Terry, Andrea and Pramila. Photo Scott Patch.